Designing passive LC-filters typically involves looking up prototype filter component values in a table in reference books like “Handbook of Filter Synthesis” by Zverev or “Design of Microwave Filters, Impedance-Matching Networks, and Coupling Structures” by Matthaei et. 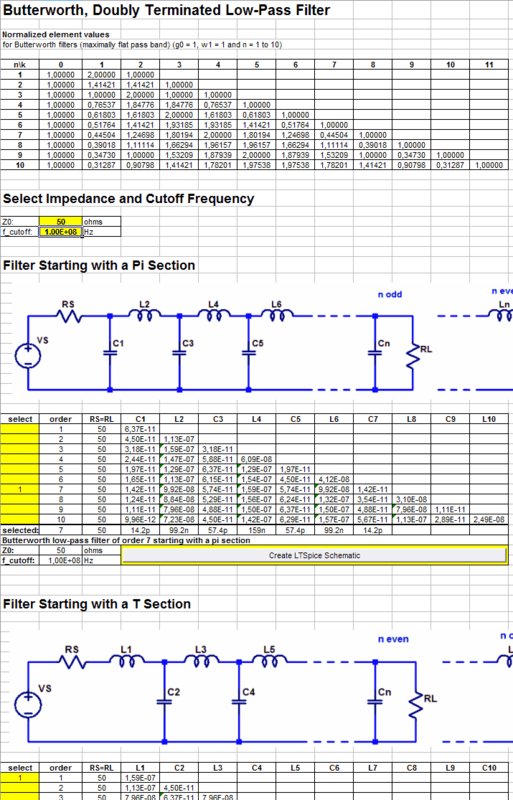 al., then transforming the values to produce a filter with the desired impedance and cut-off frequency. This can be a bit tedious and error prone, so when I found out about the classic Matthaei book, which is downloadable via the link above, and that it contains the math required to calculate the prototype filter component value tables, I set out to create a spreadsheet to help with the filter design. 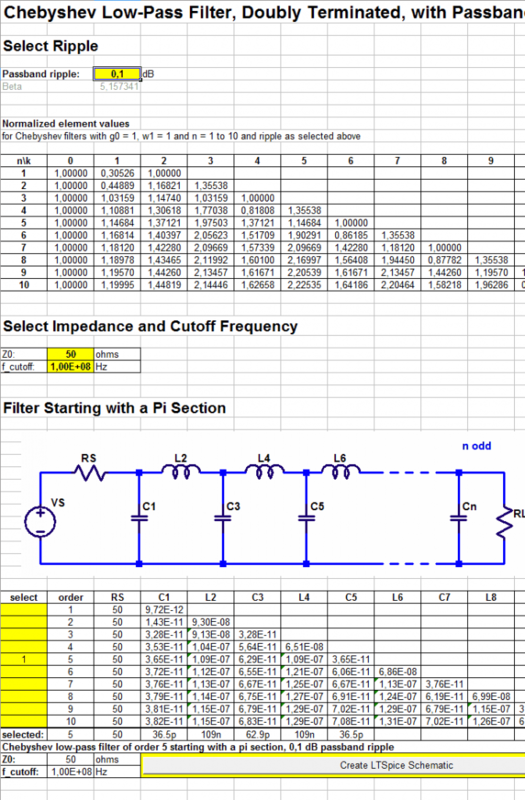 In addition to calculating the (previously) magical prototype tables for Butterworth and Chebyshev (with user-specified pass-band ripple) filters, the spreadsheet also performs the frequency and impedance transformation for filters of orders from 1 to 10. To make the design process even quicker and better, I added a feature to create LTSpice schematics of the selected filter so that the filter properties can be simulated (and perhaps manually adapted to standard component values and to include parasitics) using LTSpice. I used the SI prefix formatting function I wrote about in the previous blog post to write out the component values in a pretty manner. The usage of the spreadsheet should be fairly self-explanatory, but there are also usage instructions on the first tab. Basically, the user should fill out the values in yellow cells and leave the rest alone. I did not lock any cells, since I often get annoyed by spreadsheets with locked cells and I encourage others to modify and improve it. Make sure that macros are enabled if you want to use the LTSpice export features. 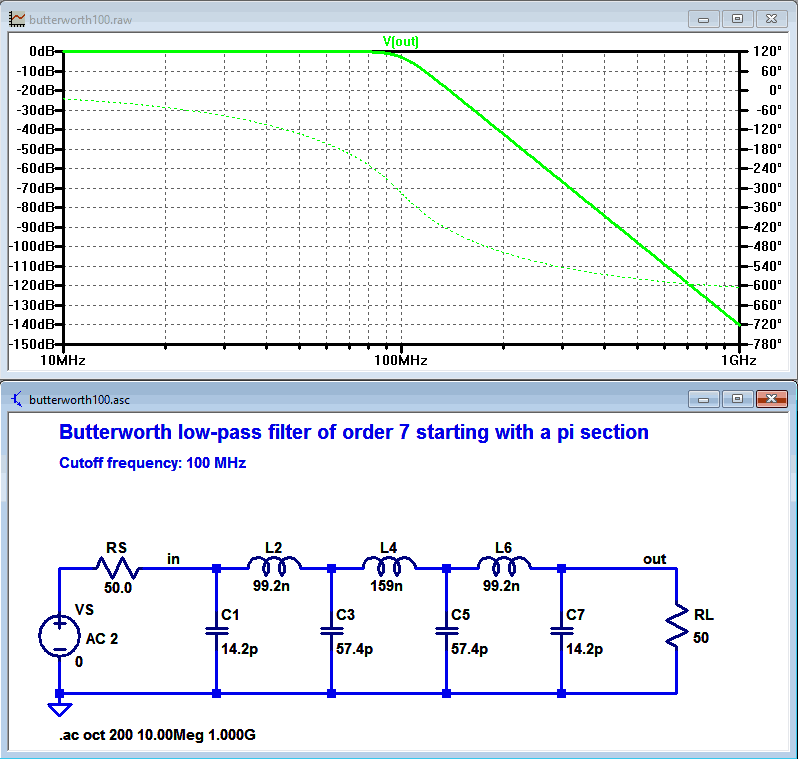 LTSpice simulation of a Butterworth schematic generated by the spreadsheet. 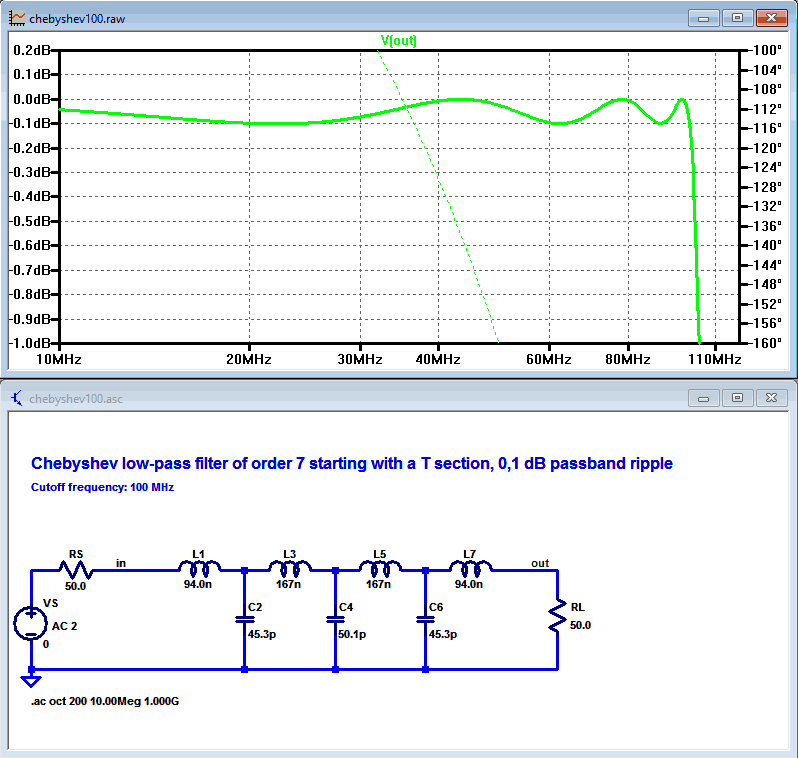 LTSpice simulation of a Chebyshev schematic generated by the spreadsheet. Excel does not have any built-in way of formatting numbers such that the numbers are displayed in a neatly readable way using SI prefixes, like m for milli (10^-3), k for kilo (10^3), µ for micro (10^-6) etc. Here I provide a VBA function I wrote to fill this need. In addition, I added support for using the prefix notation of Spice circuit simulators where both m and M are interpreted as milli and Meg has to be used to signify mega. Also, u has to be used instead of µ to indicate micro in Spice. As icing on the cake, I also wrote a function to convert the resulting strings back to numbers. The functions are called FormatPrefix and ValPrefix. Source code with detailed descriptions of the input arguments are shown further down in this post. 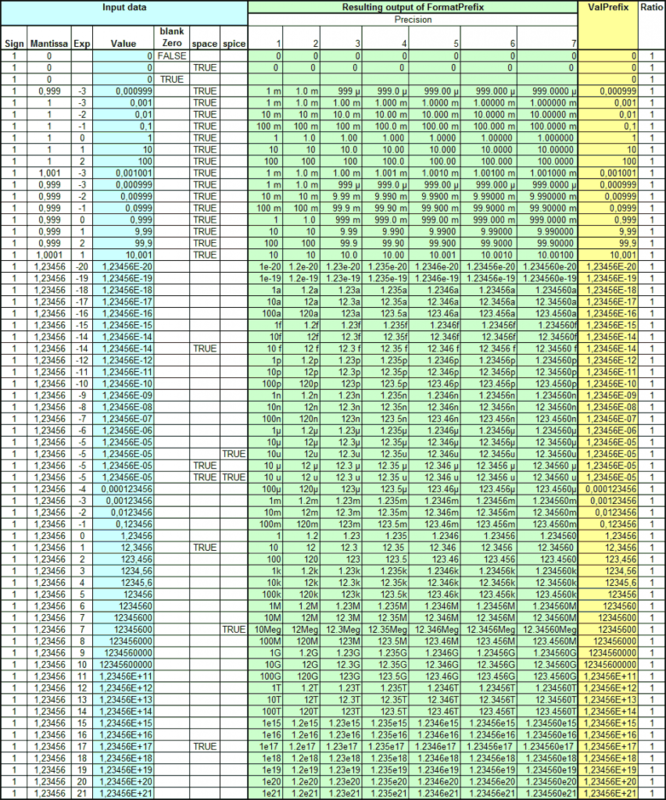 Excel table showing the output of FormatPrefix for a large set of input arguments.
' Convert a number to a string, usually with an SI prefix at the end.
' value is the value to be converted.
' Optional precision argument determines number of significant digits to be printed (default 3).
' Optional blankZero argument determines if zero should return the empty string (default false).
' a possible prefix (default false).
' (default false). The only differences are Meg vs M and u vs µ.
' The decimal indicator is always a point, even if the locale says it should be a comma.
' This code is public domain and comes without any warranty. Enjoy! formatStr = formatStr & "." formatStr = formatStr & "0"
formatStr = formatStr & "e-0"
' Convert a number formatted as a string using FormatPrefix() back to a number.
' Error checking is very limited.
' Error, handle it somehow?